It was September 1876. Dozens and dozens of premiums were awarded at the First Annual Fair of the Western Agricultural, Mechanical and Mineral Association in Missoula. The idea of a fair in Missoula County was conceived a couple of years earlier. In the fall of 1874, organizers canvassed residents and “it was pretty unanimously admitted to be a public necessity,” wrote the local paper. Then “our citizens taxed themselves to a large amount – over $6,000 – that our buildings and grounds may be of a kind of which we may not be ashamed.” By early 1875, a board of trustees was created and ground was broken. The optimistic group, meeting in the summer of 1875, set October 6 of that year for the first annual fair. But it took longer than expected for all the work on the fairgrounds to be complete. Wooden water pipes “two inches square and 640 yards in length” still had to be buried in a foot-deep trench running from “a series of springs situated up in the hills” to the new fairgrounds on Missoula’s south side. “Mr. 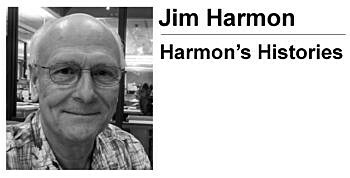 Kron, the architect at the fairgrounds,” didn’t have the main building framed until early October and Mr. D. S. Herren was still working on the racetrack, according to the Weekly Missoulian. So Missoula’s first county fair had to be postponed until September 13, 1876. In preparation, crews graded and leveled the road leading from Missoula to the fairgrounds. Other workers prepared the new racetrack. Trotting and running horses from nearby counties were brought in and housed in the newly constructed stables. Purses as high as $125 were advertised. The Bass brothers from the Bitter Root were among the major supporters of the fair. They did well in competition too, winning categories from best melon and grain collections to best display of vegetables. Their wives cleaned up, with wins for preserves, butter, gooseberries and blackberries. Still, the fair was rated a success in that the organizers broke even. But they admitted they may have erred by scheduling the event at the height of harvest time. So the fair date was moved to mid-October for the following year. 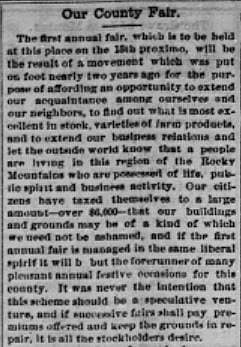 When 1877 rolled around, organizers felt they were “in better shape … to conduct a successful county fair,” but there were still problems. The Bitter Root section of the county had been “ravaged by grasshoppers … (hit) by a furious hail storm, and the whole county (had) suffered a loss of about six weeks’ time from business during the Indian excitement,” a reference to the Nez Perce exodus from Idaho through the valley. The third year – 1878 – was plagued by bad weather. “It is probable that no four days in the month of October could be so cheerless and disagreeable for a festive occasion,” wrote the Weekly Missoulian. Organizers decided the event had to be moved back to earlier date. Not only was October weather problematic, it was also well past the height of the harvest, and displaying produce at its prime was the whole point of an “agricultural” fair. 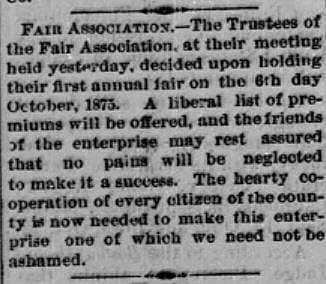 Just before the fourth annual fair was to be held in mid-September 1879, a new association was formed by financial backers determined to make it a success. That became the turn-around year, drawing a better crowd and greater participation at the racetrack.